The FAI are open to linking up with the English, Northern Irish, Welsh and Scottish associations after ‘positive discussions’. A general view of the Aviva Stadium. 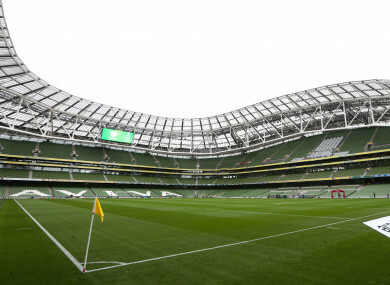 IRELAND COULD BE part of a five-way bid to host the 2030 World Cup, the Football Association of Ireland (FAI) has confirmed. The FAI will join the football associations of England, Northern Ireland, Wales and Scotland as they look to host the global tournament in 12 years’ time. In a statement released tonight, it was confirmed that positive discussions between all parties have taken place. Following recent positive discussions amongst all parties it has been agreed that the Football Association of Ireland will join the English, Irish, Welsh and Scottish FAs in conducting a feasibility review into a potential joint bid to host the 2030 FIFA World Cup,” it reads. Martin O’Neill’s side failed to qualify for this summer’s tournament in Russia, which was won by France. Qatar will host the 2022 World Cup, while the 2026 tournament is being held in the US, Mexico and Canada. Email “Ireland to join potential bid to co-host 2030 World Cup”. Feedback on “Ireland to join potential bid to co-host 2030 World Cup”.